Kerala style soft appams - How to make soft appams? Today I will share one of the best traditional breakfast recipe of Kerala – “appam / Velleappam”. This is basically steam cakes made from raw rice. This batter is prepared without using any yeast for fermentation. If you are looking for palappam recipe with yeast, you can read our other post on making of palappam. Appam can be served with Chicken roast / egg curry / Bengal gram curry /Green gram curry / Sardine curry. Vegetarians can serve appam with vegetable stew or any vegetable curry. Use raw rice (pachari) if possible. 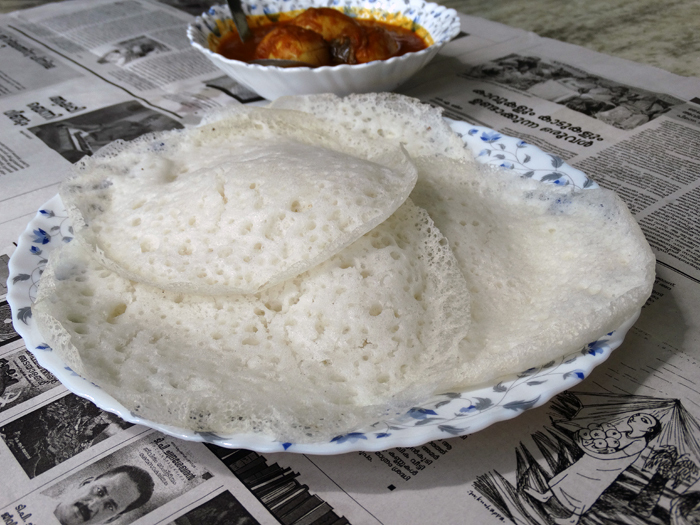 To get soft and fluffy appam use a separate “appachatti”, exclusively for appam making. Soak the rice for about 6-8 hours in water. Wash the rice three to four times and drain thoroughly. Grind the raw rice and the boiled rice together to a fine paste. Keep it for 6-8 hours. Add salt to the mixture and keep it for one more hour. Heat kadhai (“appachatti”), smear little coconut oil on it. Pour one spoon full of batter in the pan and rotate the pan in circular manner to get the circular shape of appam. Put a tight lid on it and within three minutes appam is ready to have!! Serve it hot with Chicken roast / egg curry / Bengal gram curry / Sardine curry. It will be easier to grind raw rice if you add the boiled rice first. Keep three spoon of batter for the next day. Add it to the mixture to grind (Step 3) next day preparation and it will make the appam more soft. The same can be kept in refrigerator if you are not preparing more appams next day. This entry was added on February 22nd, 2013 by Cini P Moideen in Breakfasts and Dinners and tagged with how to make soft appam, sweet appam, easy to make appm, how to make appam, breakfast, tasty appam, soft appam, kerala appam. Last revised on April 6th, 2018. Shouldn’t we be adding yeast typically to make appam? You can also use yeast instead of baking soda for the batter preparation. @Anu : the logic is simple. Suppose if you are preparing appams for two consecutive days, keep a little of the first days batter for the second day too. Mix this batter together along with the rice you are grinding for the second day. Hi, We make appams at home once in a while for breakfast. I prepare the batter with rice, coconut, yeast and a little cooked rice. Thanks for the addition Nimmy. Can you clarify whether we use coconut water or coconut milk? My mom uses thick coconut milk for preparing Palappams. Will get recipe from her for it. @Anil Kondath : At home we use a mixer for grinding. Traditionally appam was made with fresh kallu (toddy) in our Pala side.fresh toddy(mostly panankallu) give appam the ultimate taste.we grind soaked rice to a very smooth batter in little kallu and water..also can grind grated fresh coconut along with the rice.finally we add grinded cooked rice and little sugar and salt to the rice batter. Mix it well and keep it over night for fermentation..morning we get well fermented batter with lots of lather.instead of cooked rice my granny used to take a little rice batter and make it a thick paste like by keeping it on the stove in a thick bottomed vessel and continually stirring it.when it’s cooled down this paste will be added to the rice batter.